Our early indication on the State Budget is that the new Government is set to introduce a new tier of poker machine tax for clubs. Clubs Queensland are negotiating with the Queensland Government a list of favourable changes to the club industry to offset the recent tax announcements for clubs. From 1 October this year, clubs will pay a further 5% in State tax rates on monthly poker machine revenues over $850,000. The top tier remains at 35% for revenues over $1.4m. The following table shows the expected increase in annual poker machine taxes for various levels of metered win (poker machine revenue before GST is taken out). Our larger community clubs in Queensland will be up for an increase in poker machine taxes of around $330,000 each year. That further places Queensland as the highest taxing State on the eastern seaboard. Hotels will also be affected in the changes, with the Government rescinding the previous tax break with the Health Services Levy. Hotels will now revert to paying incremental tax from $100,000, whereas the previous changes resulted in tax only being paid from $140,000. Following consideration of the Independent Commission of Audit recommendations, the Government is introducing an additional tier into the gaming machine tax rate structure that will increase the gaming machine tax payable by clubs where monthly metered win (player loss) exceeds $850,000 per month. The Government will also rescind the previous Government’s decision to reduce the rate of the health services levy payable by hotels where the monthly metered win (player loss) exceeds $100,000 per month. 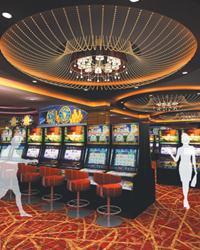 The Government is working with the casino industry to deliver an additional contribution to the Budget, which is expected to increase to $8 million per annum by the end of the forward estimates. These measures will result in a $16.5 million increase in revenue from the gaming industry in 2012-13. The Government will implement a range of regulatory reform proposals that will reduce the regulatory burden on the gaming and liquor industries, which will assist in offsetting the financial impact of these revenue measures. Please contact Geoff Wohlsen for a discussion on how this might affect your Club. The sense of arrival. The goal of this “moment” is to literally WOW your arriving customers from the beginning – to validate their selection that choosing or returning to your venue was the best decision they made. While new blood in the boardroom can be a good thing, the induction of new directors takes time and a degree of care. The first month for any director is crucial. 5 things you should be doing on Facebook right now!